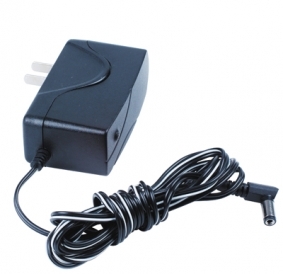 12V DC 1 Amp power supply for use with infrared CCTV cameras and other security camera equipment. This power supply has sufficient amperage for use with security cameras with 24 IR LEDs or more requiring less than 1 amps. Be sure to check the power consumption (voltage and amperage) for your security equipment. If your cable run is over 100ft on a 18 awg power wire, we recommend using a 12V 2 amp power supply to account for the power drop. 30 Days Return Policy. Used items not returnable. It is about 18 inches long. You can use 18 awg DC wire, male power terminals and female power terminals to extend a DC power adaptor.